The ultimate in 'extended stay' camping; Hampton is in a class all of it's own. Designed and appointed with all the comforts of home. Sundance by Heartland combines luxury, comfort and spaciousness to provide you with a high end fifth wheel at a mid profile price! Whether you drive an SUV, crossover, minivan, or light truck, Kodiak has an RV to fit your outdoor lifestyle. Aspen Trail travel trailers combine high-end materials and construction with smart, stylish design for luxurious yet affordable RV living. We are a full service RV dealership and campground, family run, and service camping families for over 50 years. 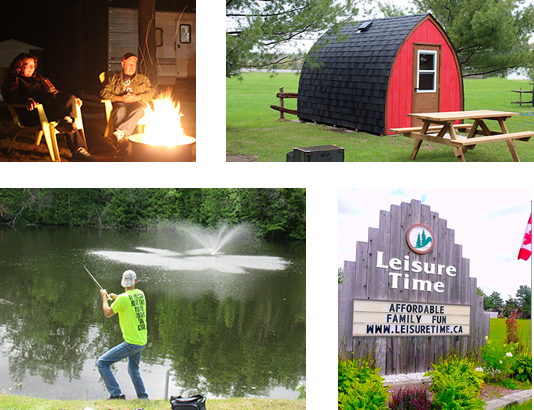 We pride ourselves on providing you a fun and safe campground where you can spend your leisure time. We offer a full service RV dealership, featuring our "No Hassle" Pricing Guarantee, and other services such as winter and summer storage. Our family camping resort is located in the rolling hills of Caledon, and just a short drive to the attractions of Toronto. We offer clean and modern facilities, including a 60-foot heated and life-guarded saltwater pool, tennis, fishing, playgrounds, and organized activities for all ages. Amenities include: a man-made lake stocked with rainbow trout, security gate, store, firewood, laundry, propane filling, RV parts and service, accessible washrooms and free WiFi hotspots. 75-foot full-service pull-thrus, big rigs are welcome. We offer 2 camping cabins for rent. Overnight, weekly, monthly and seasonal rates. Snowbirds welcome. Reservations accepted. Your Hosts, the Jay Family.